I n 2001, CCOM/JHC was recognized as a Category A educational program by the International Federation of Surveyors / International Hydrographic Organization / International Cartographic Association (FIG/IHO/ICA) Advisory Board. Category A is the highest level of international recognition that can be achieved and means the Center provides comprehensive and broad-based knowledge in all aspects of the theory and practice of hydrographic surveying and allied disciplines. 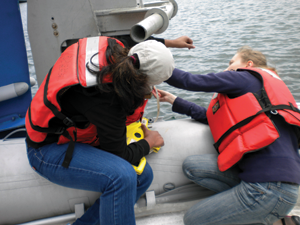 Since its founding, the Center’s objective has been on developing tools and offering training that would help hydrographic organizations meet the challenges posed by the rapid transition from the sparse measurements of depth offered by traditional sounding techniques (lead lines and single-beam sonars) to the massive amounts of data collected by the new generation of multibeam echo sounders, phase differencing sonars, and bathymetric lidar systems. To meet this goal, the Center promotes and fosters the education of a new generation of hydrographers and ocean-mapping scientists to meet the growing needs of both government agencies and the private sector. Ocean mapping is a broad field involving marine Earth sciences and includes not only the elements of hydrography, but also encompasses such topics as the geologic characterization of the seabed and the mapping of living resources and habitats. Hydrography, in the context of this program, is the measurement and definition of the configuration of the bottoms and adjacent land areas of oceans, lakes, rivers, harbors, and other water areas and the tides (or water levels) and currents that occur in those bodies of water. 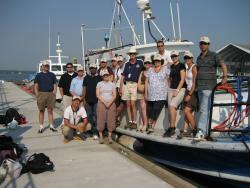 It includes elements of both physical oceanography and surveying and mapping.